Marvel’s Phase Three slate officially kicks off this weekend with Captain America: Civil War. Before that happens though, I wanna take a look back on the studio’s Phase Two, and share a few of my favorite moments from those film. To recap, Phase Two featured Iron Man 3, Thor: The Dark World, Captain America: The Winter Soldier, Guardians of the Galaxy, Avengers: Age of Ultron, and Ant-Man. 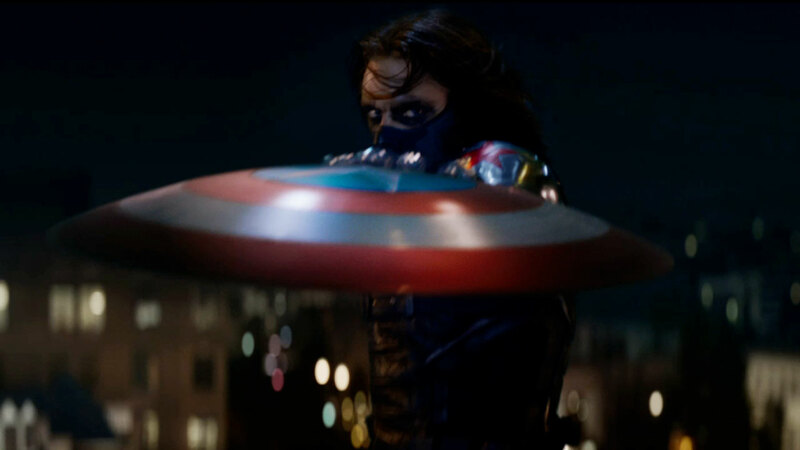 #5 – The Winter Soldier catches Cap’s shield with ease. When the first trailer for Captain America: The Winter Soldier ended with the shot above, I completely lost it. We’ve seen what kind of damage Captain America can do by throwing his shield, but the Winter Soldier catches it with ease. He then proceeds to throw it back at Cap, giving him a taste of his own medicine. This moment established the Winter Soldier character as one bad motherf*cker. #4 – Gamora almost falls for Peter Quill. There are so many great moments in Guardians of the Galaxy, but I chose this one because, well I love it when two protagonists have a moment (i.e. Rey & Finn). All her life, all Gamora has ever known is how to be a fierce warrior. Until she has a personal conversation with Peter Quill, and begins feeling something she’s yet to experience through the sounds of “Fooled Around and Fell in Love” (by Elvin Bishop). Just as she’s about to kiss Peter, she’s snaps out of the moment and puts a knife to his throat while referencing his “pelvic sorcery”. Peter’s reaction on how the moment took a 180 is priceless. #3 – The Vision lifts Mjölnir and stuns Thor & the Avengers. Upon my first time watching Avengers: Age of Ultron, I thought the party scene involving each Avenger attempting (and failing) to lift Mjölnir was simply for fun. However the scene paid off greatly later on when Vision’s allegiance and intentions come to question. He explains that he’s on the side of life, and then proceeds to lift the hammer (with ease) and hands it to Thor. The move catches everyone off guard, including us the audience. Through my multiple viewings in theaters, there was no moment that generated more laughs than this one. It also definitively told us the Vision was a good guy. #2 – Loki has fun impersonating Captain America. Thor: The Dark World is a pretty dark and serious movie at times. Luckily Marvel decided to lighten up the final product through reshoots that added more humor and more Loki. As a result, we got one of the funniest moments in Phase Two. Loki stole every scene he was in, but it was during his escape with Thor where he really shined. During the entire sequence, Loki is beyond excited that his brother is doing something bad. He cannot contain himself as he takes on different appearances to ease his brother’s tension, including Captain America. Its a welcoming fun scene, especially after the long sequence involving the funeral of Thor’s mother. #1 – Iron Man, Thor, and Vision break Ultron. The climactic battle in Avengers: Age of Ultron features no shortage of awesome moments. Joss Whedon tried to outdo himself, and although I thought he fell short, he still gave us what’s perhaps the most comic book-y moment in the MCU. After taking a big hit from Thor’s hammer, the armor on Ultron’s final form breaks thanks to the combined power of Iron Man arc blast, Thor’s lightning, and Vision’s power beam from his infinity gem. Seeing the shot featured in the image above was icing on the cake, and a true fanboy moment. There you have it. I’m so ready for Phase Three. What are some of your favorite moments in Marvel’s Phase Two?